Blessed Unrest is presenting the compelling new play This Is Modern Art written by Idris Goodwin and Kevin Covall, directed by Jessica Burr. We experience a dramatization of a clandestine graffiti bombing of the Art Institute of Chicago which took place in 2010. You will certainly gain new perspectives from the debate on what art is and who decides who gets to make art. This piece was commissioned by Chicago’s Steppenwolf Theater (where it premiered in 2010) and was developed by New Voices/New Visions at The Kennedy Center in 2014. 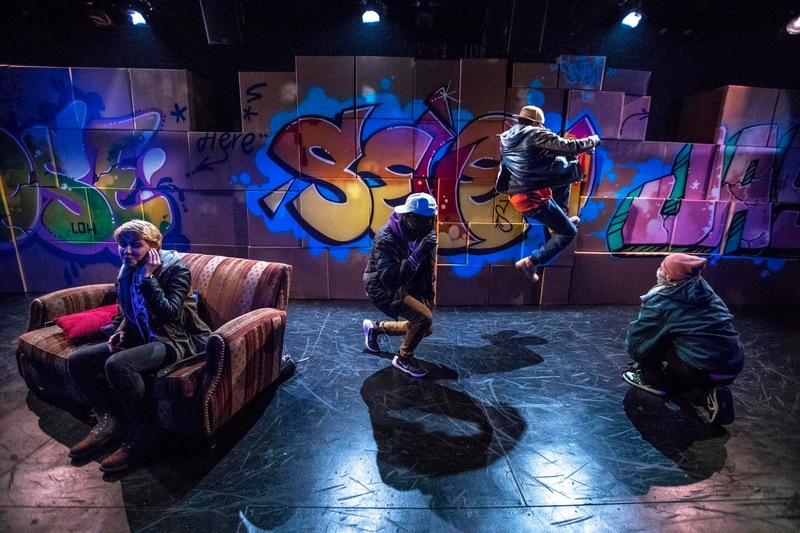 The performance I saw was followed by a talkback with the show’s Scenic Artist, veteran graffiti writer KEO XMEN. It is Chicago in the winter of 2010. Selena (Nancy McArthur) is a young woman who hangs out with a crew of graffiti writers. In her words, "I can't draw, but I DO have a car." As will become clear, those who don't have their own space to create and exhibit art must work very carefully together. Selena helps keep a lookout for the police and takes her friends to safety after they put up a "piece" (i.e. a planned work, or masterpiece) on someone else's wall. Their work is often noticed and removed within a few hours, but brings immediate joy (in contrast with decades-later art appreciation) to many dispossessed people (and consternation to wealthy property owners). The Look Over Here (LOH) crew is made up of J.C. (Andrew Gonzalez), who took his new name from sports and religious personalities and Mexican populist muralists he admires, Seven (Shakur Tolliver), who is inspired by Chinese numerology, and Dose (Landon G. Woodson) who thinks MC Escher is a rapper and who doesn't see himself doing safe projects like invitation walls. LOH do not use their government names or spend much time in the "respectable" art world (which is ingeniously represented from time to time by Ashley N. Hildreth and J. Stephen Brantley as a variety of art snobs, passersby and tweeters); mistreated by the law and with racially-biased arrest records, they could never lead the carefree life Selena does. Graffiti artists, prepared for any outdoors survival situation, prefer to work at night and in fog and snow conditions. LOH's efforts have become more and more ambitious, like the "chi" energy that reminds you of Chicago. J.C. discovers that patrol cycles and a busted security camera could give LOH enough time to piece the wall of the modern wing of the Art Institute. They will have 14 minutes. If you've seen Blessed Unrest's work, you might be prepared for wild and crazy transformations of ordinary scenic objects. For this show, the set is dominated by dozens of plain-looking brown boxes. During the dramatic scene outside the Art Institute, J.C., Seven and Dose turn and rearrange all of the boxes to create a very colorful work of art. They all escape with Selena and settle down to dinner (one of the boxes is opened to produce a table cloth), where they learn from TV news that their masked activities were caught on security camera. Since we still don’t know the identities of the graffiti artists, the play ensures that they separate and lie low for a while. Selena is even pressured by her parents to talk to a lawyer and find a way to protect herself, lest she is sued for $1 million. While these characters find new horizons to pursue, their success is bittersweet. Art is still largely the domain of white, elitist institutions and graffiti is hurriedly removed at taxpayer expense. This play is well-written and fast-paced. The excellent ensemble under Jessica Burr’s direction examine many viewpoints about art and culture which often enough are not heard in the mainstream media. Matt Opatrny’s scenery, Heydee Zelideth’s costumes and Miriam Nilofa Crowe’s lighting keep things very real, focusing less on the urban environment than on the crew’s ability to reshape their surroundings. Things came into sharper focus thanks to the talkback with KEO XMEN. He began writing graffiti in Brooklyn, NY in 1979, and nowadays is in demand as artist and consultant for detailed 1970s and 80s period pieces such as “Vinyl”. His stories of the 1970s show us a time when New York City was falling apart and, perhaps, spray paint was the only thing holding some subway cars together. Urban children whom the bankrupt city couldn’t afford to educate were drawing masterpieces by age 9-15. Such artists, who could turn urban decay into pockets of beauty for their neighborhoods to enjoy, could, working together in crews, cross areas controlled by different gangs and achieve surprising things. Gangs might be seen guarding a graffitied handball court. The transformative power of this art made a big impression on me. If KEO XMEN senses the authenticity of storytelling in This Is Modern Art, I’m sure that you will, too.